Disney California Adventure is home many different aspects of California each sprinkled with pixie dust magic – one staple of California is the Pier. You can find many different piers all down the west coast. However, it’s entirely possible that the most fun pier isn’t even on the ocean. 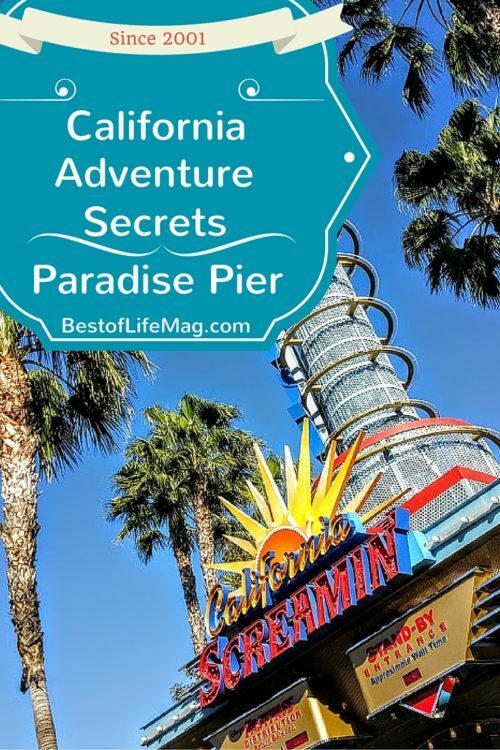 Instead, you may have more fun at the pier located in California Adventure Park, Paradise Pier. 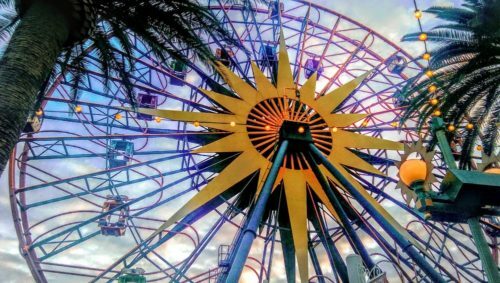 Home to World of Color, Screamin’ Coaster and Mickey’s Fun Wheel, there are many California Adventure Secrets in Paradise Pier. One of the most iconic rides on Paradise Pier is California Screamin’ Coaster. Screamin’ a co-star in the World of Color, used to be home to one of the biggest hidden Mickey’s that wasn’t so hidden and has a high ranking in length. At 6,072 feet, Screamin’ is the third longest coaster in the United States and is the 6th longest in the world with an inversion. While the Mickey ears are gone, the magic still remains. The iconic Mickey was moved from Screamin’ over to the Ferris wheel adding a new name; Mickey’s Fun Wheel. 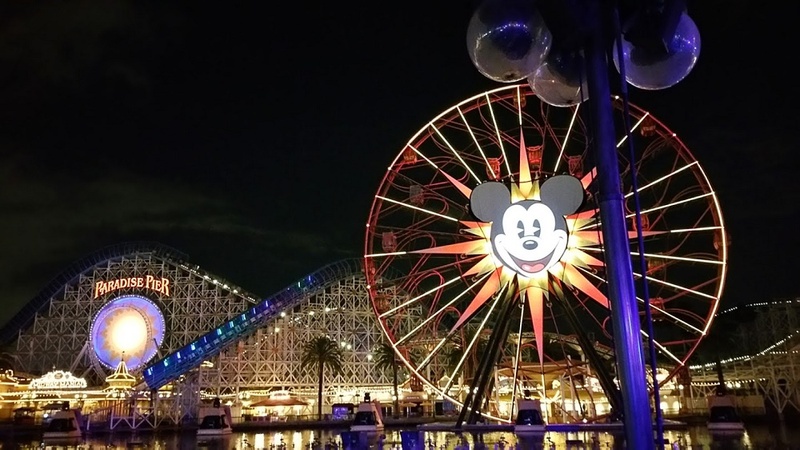 Mickey’s Fun Wheel gets a starring role in World of Color at night, but for very good reason. 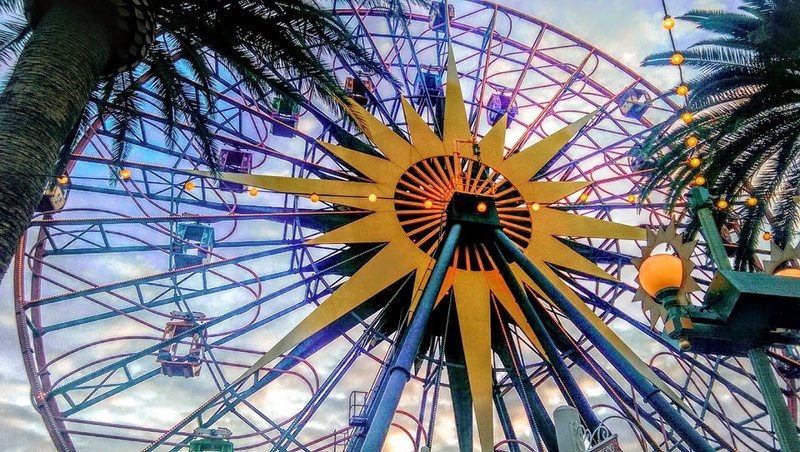 The Ferris wheel is 158 ft tall, making it taller than the Matterhorn in Disneyland. Bonus fact: the Matterhorn is 147 ft tall which is 1/100th the size of the real life Matterhorn Mountain. Disney doesn’t always make the secrets and facts in super-sized versions, some facts are smaller and harder to notice. On the Boardwalk, there is a gazebo which is not a secret. However, on top of the gazebo there is an early 20th century scrolled woodwork piece that was very common on the piers in California in that time. The woodwork shows silhouettes of Donald himself. The Boardwalk is also home to a Disney Classic surrounded by all the Pixar fun. Stop at Boardwalk Pizza & Pasta for a bite but keep your eyes open at the counter. Behind the cast member helping you look for the hidden Pinocchio toy. Must have ended up there with the rest of the toys from Toy Story. This secret is becoming less and less of a secret every day. Sitting right behind Ariel’s Grotto is Cove Bar. You can get some great eats at Cove Bar and you can impress everyone you’re with by ordering off the menu. There are a few alcoholic drinks that are off the menu but still carry that Disney magic. Try Ordering a Mickey’s Fun Wheel, Melrose Place, The Black Pearl or The Zombie. These drinks can also be found at other places throughout the park like Carthay Circle Restaurant, but Cove Bar just does them the best. California Adventure is full of secrets just waiting to be found. You could spend an entire morning searching for California Adventure secrets on Buena Vista Street, or you could take some time to look for secrets in Hollywood Land. No matter where you go inside the Disneyland Resort, there are secrets to be found and fun to be had.